New varieties of carrots started showing up here over the past several years, with the advent of farmers markets. Purple, red, yellow, white, you now can find them in upscale locations like the Tel Aviv Port. But actually, purple carrots aren’t new to Israel, and they’re certainly not the reserve of the upper middle class. They’ve been available in Arab markets since long before anyone had ever heard of farmers markets. Those who know a bit about carrot history know that these vegetables were not originally orange. 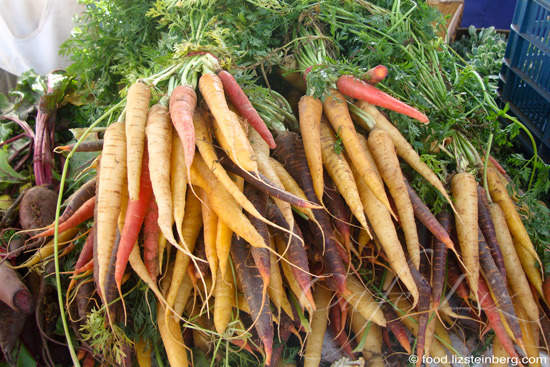 What we now recognize as a carrot was popularized only in 17th-century Holland. Carrots are thought to have originated in Afghanistan, where they were domesticated centuries before they reached Europe. 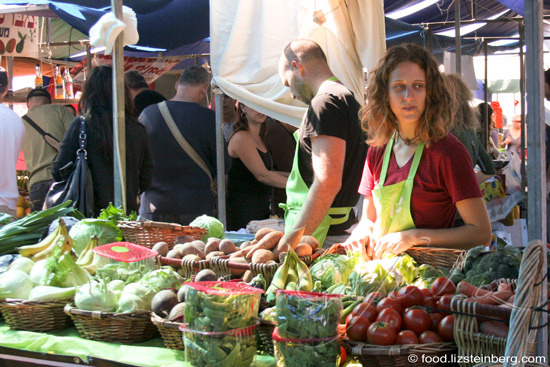 The Tel Aviv Port farmer’s market — everything in tidy little baskets. Multicolored carrots at the Tel Aviv Port farmer’s market — look how long and elegant they are compared to the old-school variety, below. That brief history lesson helps us understand the two kinds of purple carrots grown here (top photo). The ones at the farmers market are long and delicate, often with orange cores, while the “baladi” ones in Arab markets are gnarly and fat, with purple exteriors covering mixed yellow-purple cores. 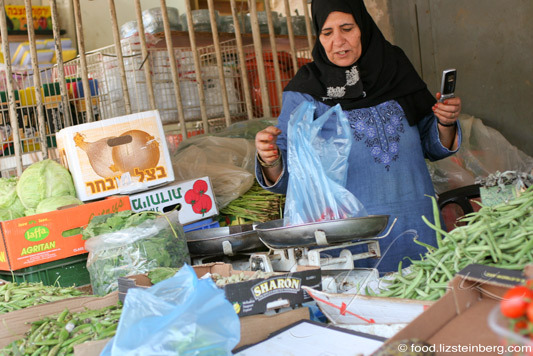 One of my favorite sellers in Ramle, with a broad selection of vegetables catering to traditional Arab cooks. Purple carrots in Ramle last March. In both kinds of markets, you’ll find these carrots available only during their season, which started sometime in November for the farmer’s market carrots and later for the baladi variety. I’ve seen them sold as late as March at the Tel Aviv Port and the Ramle market, and also at a little vegetable shop at the corner of Jerusalem Boulevard and Yehuda Hayamit in Jaffa. If you want to eat carrots year-round, as modern agriculture has accustomed people, you’ll have to resort to the more common orange variety, which is kept in cold storage throughout the year. “Although one might expect the interesting colors of this variety to confer commercial value in Western markets at least as a novelty, the fact that the pigments are water soluble, like those of beets, seems to have limited its appeal in the West,” notes EOL Species. An amusing comment — sometimes this is a disadvantage, such as the time when I made a Moroccan carrot salad with purple carrots and everyone thought it contained beets (OK, not due to the reason cited above — I was upset no one appreciated my special carrots). But sometimes it’s an advantage, such as the time I put purple carrots into otherwise-white curry and it came out a vibrant fuchsia. 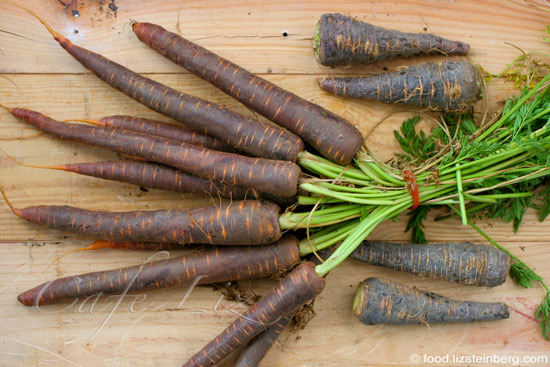 Not to mention that if you eat one of these carrots raw, they’ll turn your tongue purple — a surefire way to amuse a child (and let’s admit it — some adults, too). On the other hand — if you put purple carrots in carrot cake, the cake will still be a ruddy brown, but the carrot shards will be a purplish black. 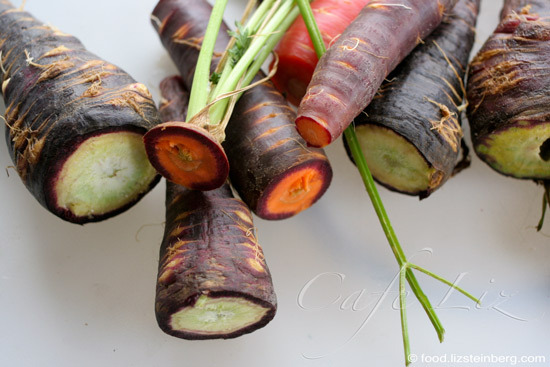 Baladi carrots with greenish-yellow cores, and purple and red farmers market carrots with orange cores. So once you’ve sought out your colorful carrots, what do you do with them? If you bought them at the Tel Aviv Port, you’ll probably consider putting them into a multicolored carrot salad, serving them as colorful vegetable sticks or perhaps frying them into colorful carrot chips. If you bought them in Ramle, well, you might hollow them out and stuff them with meat and rice, a traditional Arab preparation for many and sundry vegetables. When in season, you can find stuffed purple carrots at Samir (Kehilat Detroit 7, Ramle), a restaurant run by a veteran Ramle family. 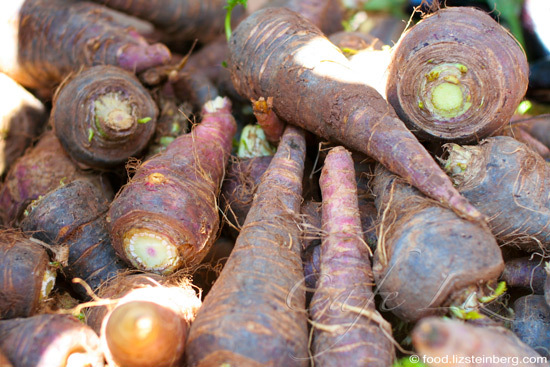 When not in season — and for some reason, the purple carrot season already ended in Ramle this year, even though it’s still going strong in Jaffa — you can make your own stuffed carrots, and you can even use Samir’s recipe. (Sarah reports that Samir has finished serving purple carrots for the year; they also serve stuffed orange carrots, but not every day). The following is my (vegetarian) adaptation of that recipe, so you, too can bring a taste of carrot history into your home. I used a colorful mix of baladi carrots and purple and red carrots from the farmer’s market, which I think makes for particularly nice presentation. I love how the rice turned a beautiful purple. Note: The recipe calls for sour plums (arasiya in Arabic), which are abundant in spring and summer, but considerably harder to find dried in the markets. The store at the corner of Levinsky and Ha’aliya Streets carries them; many of the other stores at the Levinsky market do not. The plums give a wonderful flavor, so they’re worth finding. Prepare the carrots: Remove both ends from each carrot. On the narrow end of the carrot, you’ll want to remove the thinnest part, so that the cut surface is a few millimeters thicker in diameter than your vegetable corer. Cut the carrots into 10-centimeter (4 inch) segments (not necessary for the baladi carrots, which are small). Hollow them out with a vegetable corer. Carrots are more brittle than other commonly stuffed vegetables, so be aware that they might crack a bit (not the end of the world). 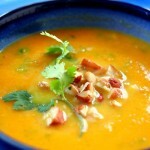 The carrot innards can be used for other things, such as soups or my lemony carrot salad recipe. 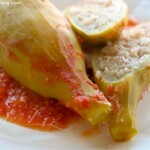 Prepare the filling: Rinse the rice, and mix it with the spices, lemon juice and 2 teaspoons of olive oil. Fill the carrots with the rice mixture from both ends, but don’t pack it into place. You’ll most likely have some rice mixture left over. Finely chop or crush the garlic. Fry it in the 1 tablespoon of olive oil in a pan — the pan needs to be higher than the thickest carrot, and large enough to fit the carrots in one layer. Add the plums to the pan, and arrange the carrots in one layer. 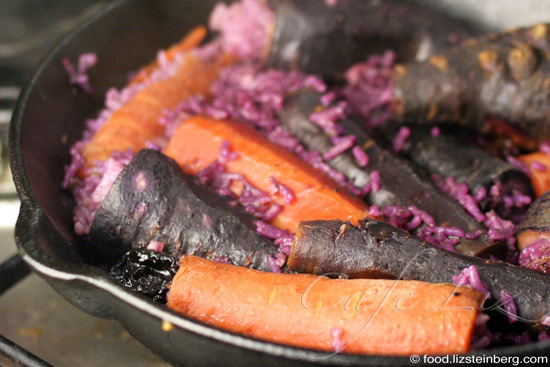 Any leftover rice can be dumped into the pan alongside the carrots. Cover the carrots with hot water, and bring to a gentle simmer. Cook until the carrots are tender, about 30 minutes. 9 Responses to "Purple carrots, old and new (and a stuffed carrot recipe)"
I don’t think I’ve ever seen dried sour plums stateside. Would prunes, or maybe dried cherries, be a good substitute? Hey, I’m not sure they would. The sour plums are very sour and tangy, so an equivalent might be sour apricots plus lots of extra lemon juice. A Persian dried lemon would create the same effect as the sour plums, but would also take the flavor toward a completely different ethnicity. One dried lemon — if not half a lemon — would probably be enough. 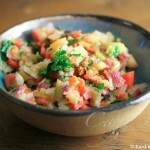 Liz, This is an amazing recipe and a great story. I like visiting your blog to read all this interesting stories you tell us about. If I ever have a question about carrots, orange, purple or otherwise, I know who to ask. Those stuffed carrots look so beautiful nestled in there. In the cookbook “Please to the Table”, about food in the FSU, tamarind concentrate is suggested as a substitute for sour plums. I assume one would dilute a tbsp or so of the concentrate with hot water or other hot liquid to get the desired sour fruit effect. Hey Esther, that’s interesting to know. Thanks.